Books are Just the Beginning at Nebraska public libraries and there has been a 17% increase in attendance at programs offered by Nebraska public libraries. 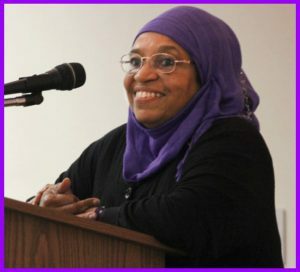 “Getting to Know American Muslims and Their Faith” will be presented by Maisha Godare, Heartland Muslim Women’s Network President, April 12 at the North Platte Public Library. The program will be an overview of American Muslim life and culture illustrating what it means to be Muslim in America. for more information see http://libraries.ne.gov/northplatte/2018/april-12-program-on-american-muslim-life-and-culture/. Books Are Just the Beginning at Nebraska libraries, and wellness programming at the Arapahoe Public Library is a good example. 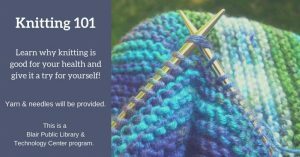 The library invites area health and wellness professionals to provide educational programs and community members learn how to improve their health free of charge. 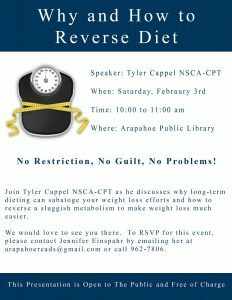 Find out more about personal trainer Tyler Cappel’s program on how chronic dieting can impact metabolism and hormones at http://libraries.ne.gov/arapahoe/2018/01/18/why-how-to-reverse-diet/. Books are just the beginning in Nebraska libraries and Loup City Public Library is hosting a rotating Library Innovation Studio to offer their community the opportunity to explore, collaborate, create, learn, and invent. See some of the items that community members are making at: http://libraries.ne.gov/loupcity/2018/01/03/items-made-in-our-library-innovation-studio-you-can-make-something-too/. Loup City Public Library is one of thirty libraries participating in the Library Innovation Studios: Transforming Rural Communities project. 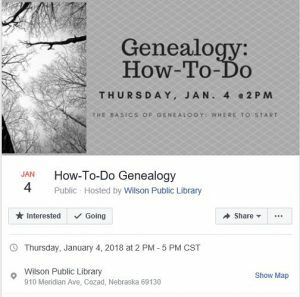 The Nebraska Library Commission along with partners University of Nebraska—Lincoln, Nebraska Innovation Studio, Nebraska Extension, and Regional Library Systems, are excited to see how the project, funded by the Institute of Museum and Library Services (IMLS), can support community engagement and participatory learning experiences in small rural libraries across Nebraska. For more information see http://nlc.nebraska.gov/grants/innovationstudios. This project was made possible in part by the Institute of Museum and Library Services [grant #LG-95-17-0046-17]. Books Are Just the Beginning in Nebraska Libraries and the partnership between Nebraska Extension 4-H and the Clay Center Public Library is another great example. Young people (Grades K-3) will learn about flight and rocket components. They will also build their own edible rockets. For more information see https://i1.wp.com/libraries.ne.gov/claycenter/files/2017/11/IMG_2494-e1511905684214.jpg. 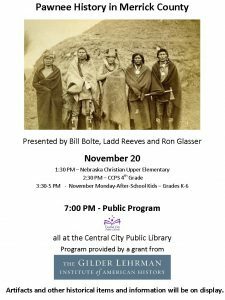 Nebraska Libraries are great places to learn about other cultures and Ashland Public Library’s culture-sharing program for children and adults is a great example. On Saturday, October 14, Yukiko Shimono will share her Japanese culture and tell a story for children. Following the children’s event she will perform a Tea Ceremony for adults. 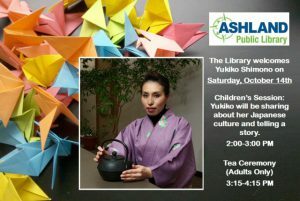 For more information see http://libraries.ne.gov/ashland/2017/09/19/yukiko-shimono/. Books Are Just the Beginning at Nebraska Libraries and Coding Camp for youngsters in Grade 2-8 at the at the Central City Public Library is one more example. This class is sponsored by Nebraska Extension and designed so that anyone who can read, can learn to code in a game environment. For more information see http://libraries.ne.gov/centralcity/2017/09/20/sign-up-for-coding-camp-here/.